If you haven’t had a chance to try our organic chicken stock, you can look for it at select Fortinos stores, The Big Carrot, Fiesta Farms, Nature’s Emporium, Highland Farms, and Yummy Market. And we’re hoping to add more retail locations soon. 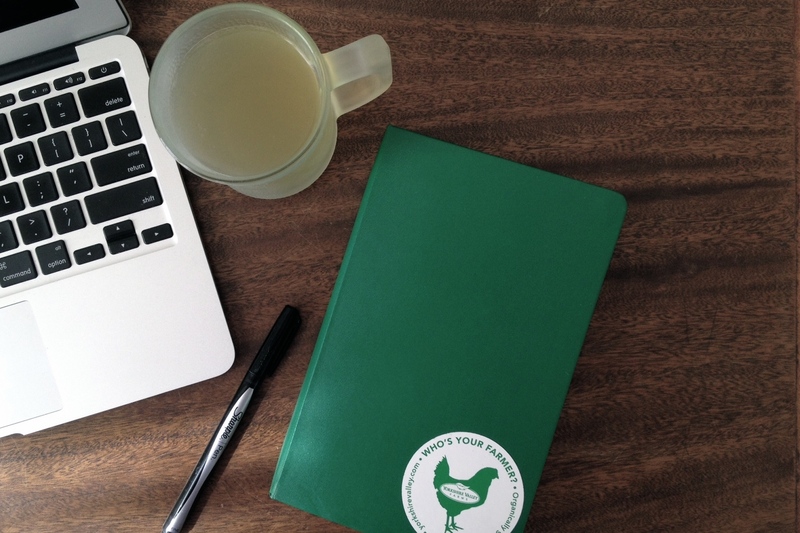 Some YVF team members like to enjoy a mug of warm stock as an alternative to coffee or tea. How do you make your organic chicken stock? We make our stock the old-fashioned way, like you would at home. Only we have a much bigger pot so that we can make it in large batches. The recipe starts with our organic chicken bones, to which water is added. Then we layer in organic vegetables and seasoning and let the liquid simmer away. It’s really a fairly simple process, but that simple act of simmering allows us to extract lots of flavour from the organic chicken bones, vegetables and seasoning. We don’t add any artificial colours or flavours, nor do we add any sugar or flavour enhancers. What ingredients are in your stock? The list of ingredients in our stock reads pretty much like your grandma’s recipe: water, organic chicken, organic onion, organic celery, salt, organic carrots. Because we make our stock using organic chicken bones, we’re able to extract all the goodness that is trapped inside the cartilage and connective tissue. As we simmer the bones, collagen is released, and that is what helps to give our stock ‘body’ or a silkier, thicker texture than plain water. What ingredients are NOT in your stock? We don’t add any of these to our stock. All of our ingredients are organic and non-GMO. There are no artificial colours or flavours, no added sugar, and no flavour enhancers. What’s the difference between “stock” and “broth”? These two terms tend to be used interchangeably in modern kitchens and you’ll likely find different theories on the meaning of each. The most common explanation says that a “stock” is a liquid that is created by simmering bones in water, while a “broth” is a liquid made from cooking meat in water and is usually served with bits of meats and vegetables in it. Because stocks use bones, they tend to have more texture and a richer mouth feel than broths. In the home kitchen, the bones used to make a stock often have bits of meat attached, so the end product is a bit of a hybrid. 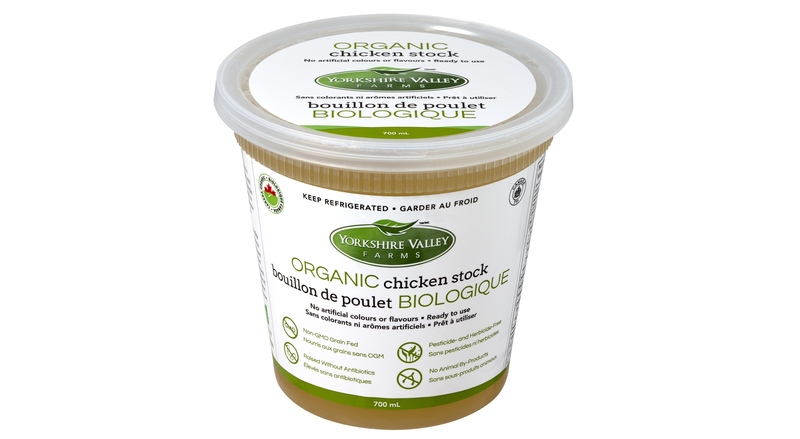 This is the case with our organic chicken stock. Because we start with organic chicken bones, we are following the traditional stock making process. But our bones do have small bits of meat attached, so you get the additional flavour that comes from the meat, plus the organic vegetables and seasoning that we add during the simmering process. Our stock is ready to use, so you can simply heat and serve, or replace it for water in your favourite recipes. To find a Yorkshire Valley Farms retailer near you, visit our Where to Buy page.